This homework has two parts. In the first part, the students use Stoke's Law to determine (a) the relative sizes of olivine and plagioclase settling at the same velocity (and relate their answer to observations made on cumulate rocks in the lab, (b) the length of time it would take a xenolith-bearing basalt on Hawaii to reach the surface, and (c) to realize that pumice landing on seawater will float, not sink! In part 2, the students fill out a worksheet to see the effects of simultaneous fractional crystallization of olivine, clinopyroxene, and plagioclase on residual melt composition, and then determine whether the melt follows a tholeiitic or calcalkaline trend. The homework involves simple algebra, but several unit conversions and normalization of the results. 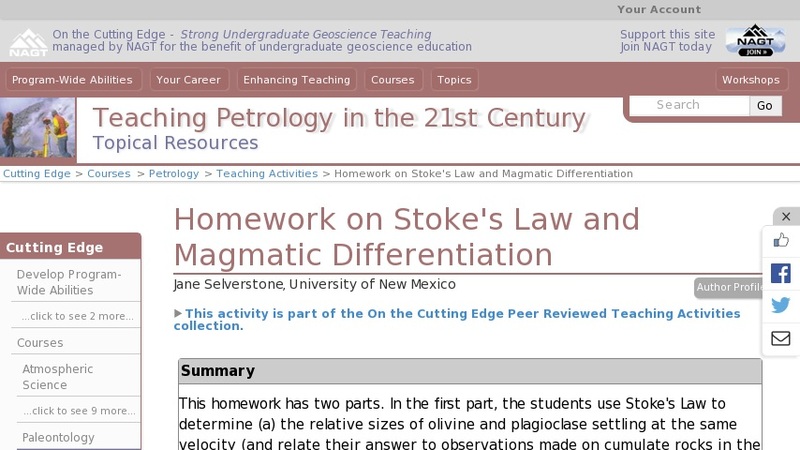 After the students hand in the homework, we have a class discussion on the assumptions and problems associated with using Stoke's Law to model magmatic processes. We also work with different colored marbles to see the effects of fractional removal of different "minerals" on residual magma composition. My main goal in assigning this homework is to have students see that they can use simple math to come up with results for themselves, and then to have them think about the significance of those results.